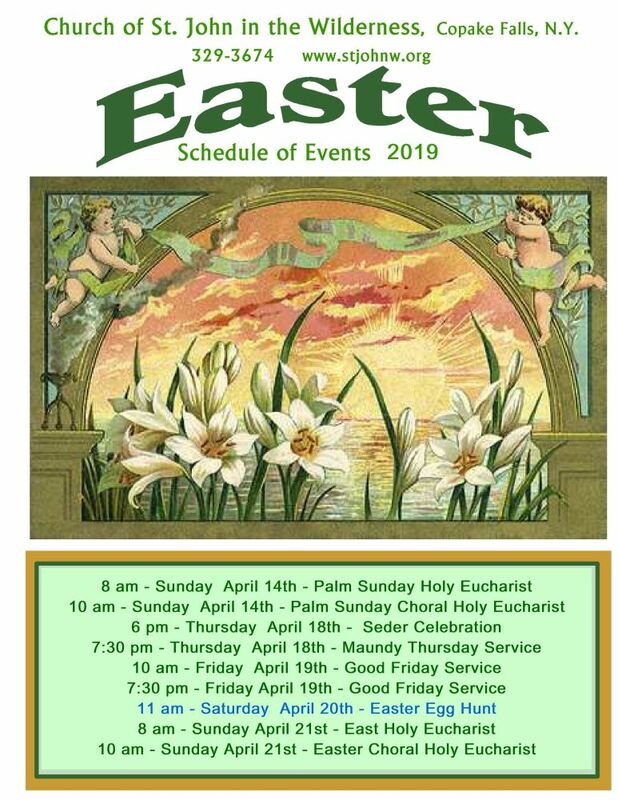 We now approach Holy Week and Easter. Be with us as we celebrate these ancient and universal traditions of our faith. Centerpiece of the Jewish celebration of Passover is the Seder meal, a retelling of their liberation from Egypt. Jim Hedrick will lead our Seder on Maundy Thursday at 6 pm, followed by Holy Eucharist at 7:30. Breathtaking poster. Voice in the Wilderness for April is here. Fr John muses on faith and abundant life. Lucy Eldridge reports on a retreat to Holy Cross Monastery that a group made in February. It was a day of worship and renewal. Marjorie Hoog, senior warden, reports that "things are chugging along nicely". Bob Dodd, laments again the tension in the Anglican Communion over LGBTQ rights, now surfacing in preparation for the Lambeth Conference for 2020. 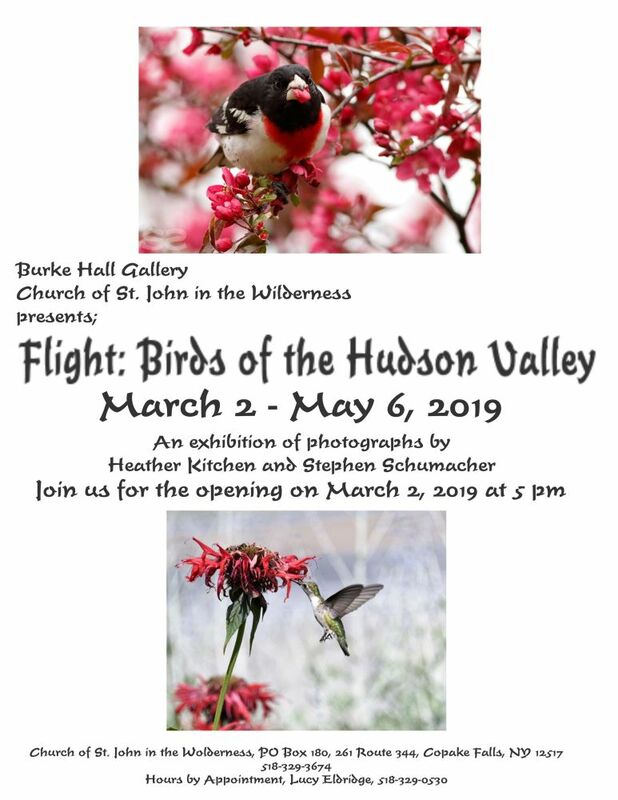 Flight: Birds of the Hudson Valley, an exhibition of photographs by Heather Kitchen and Stephen Schumacher, will be on display in Burke Hall through 19 May. Come to the opening on 2 March at 5 pm. See poster for more. We mourn those lost in the terrible shooting at Tree of Life Synagogue. Our rector, Rev John Thompson, lived in the Squirrel Hill neighborhood and has friends in the Tree of Life congregation who knew the victims. His letter to us. Holy Cross Monastery, an Anglican Benedictine community in West Park welcomes visitors for a day or a longer spiritual retreat. Fr John encourages us to spend some time with the monks in prayer and worship. It can be a life changing experience. West Park is on the Hudson, about a 70 minute drive southwest. If you would like to receive occasional emails from Fr John on church activities, request a subscription at info@stjohnw.org. Church of St John in the Wilderness is located in a park-like setting, Taconic State Park! We're on the Harlem Valley Rail Trail and Bash-Bish Falls is just up the road. Come, enjoy! We made a list of the many Good Causes supported by St John in the Wilderness. Can you add to this list? Divine Reading & Contemplative Prayer Group: Gather with us Wednesdays at 3 pm in the rectory for the Divine Reading & Centering Prayer Group. This meditative approach to scripture will bring peace to your soul. Our little church hosts meetings of Alcoholics Anonymous twice a week, on Friday and Sunday at 7:30 pm. "We claim spiritual progress not perfection." AA calendar.